When students want to tell a story digitally, or present information they know about, there are several excellent tech tools they can use. You may recall I compiled a List of Digital Storytelling Tools, which brought together links to the actual tools, links to my example of some tools, links to my whole reviews of other digital storytelling tools, and links to articles about digital storytelling in general. In Creating Digital Stories with iPad, I focused on iPad tools only and brought together apps I’d reviewed, and a list of other possible apps. Recently I was asked to choose a few of my favourite ways for kids to make a digital story or presentation of some kind. Today I’ve listed my personal favourites here so you don’t have to wade through a huge list if you don’t want to. There's a lot of overlap but I've tried to separate them into categories. Some use mobile platforms, some are software, some use the web. Storybird - web-based. Brilliant story-maker which offers art work for students to use in the creation of their digital stories. Read my article, Create Story with Storybird for more information. There’s also an iOS app, Lark by Storybird, for creating poetry, and you can read about it here. Camera and an image editor - various. You can find an example of this in Visual Storytelling. The storytelling activity might use a combination of an iOS device’s camera, a web-based image editor, and/or software that accompanies a “real” camera. Pages - Software for Mac. A fully featured text editor that might be the answer if your kids are interested in compiling stories into a magazine or book. Strip Designer - iOS app. Not just a comic editor, Strip Designer also facilitates children representing their learning in a digital and visual way. Check out its possibilities in Children’s iPad App, Strip Designer. We Publish - iOS app. 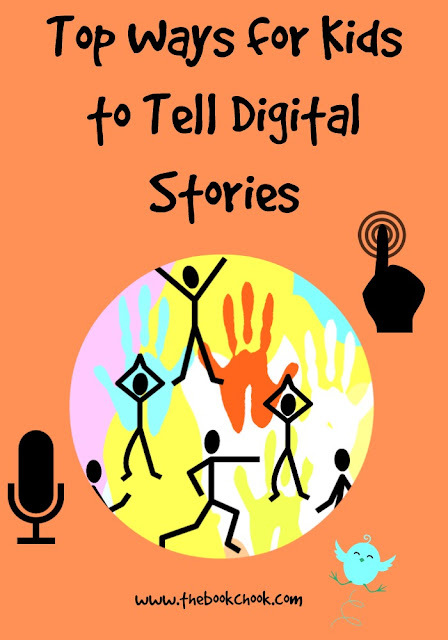 Not only can children create a digital story but that story can be printed out into a little booklet! Read my review here. Shadow Puppet - iOS app. Shadow Puppet works really well as a means of presenting information by weaving together photos or video clips, narration, music, and animated bling. The result is a video you can share. Read more in my review. 30 Hands - iOS app. 30 Hands is a lot like a slideshow with audio added, then you can save it as a video. Perfect for simple digital stories. My review is here. ToonToolkit - iOS app. I just love this app, but I’m quite prepared to believe it may not suit everyone. Still, it’s the top of my list here because these tools are MY favourites. Read my review here. Comic Life - Software for PC and Mac. Comic Life must be on this list, not just because it is one of my favourites, but because it’s so versatile, adaptable and worthwhile. Kids can use their own illustrations and photograph them or scan them. Or they can use photographs, perhaps to show the changes in something over time, as well as to tell a digital story. Check out an example of it in Using Comics for Information Reports. MakeBeliefsComix - web-based and iOS. Simple to use supplied art work to tell and edit a story, and multiple languages supported for the text you add. Read my web tool review here, and my app review here. Creaza’s Cartoonist - web-based and iOS. Cartoonist is just one of Creaza’s tools - all are worth exploring with students. I love the many worlds on offer and the fact that there are lots of features to help you create a story. Read more in Cartoonist - Sharing Stories with Cartoons. Chatterpix Kids - iOS app. This app uses the iPad’s camera to take a photo, then kids can bring the pic to life by recording themselves while the mouth moves. Read my review here. YAKit Kids is similar. Blabberize - web-based. Drawn and photographed images can be edited, then a “mouth” is positioned on the face, and kids add their own audio. Here’s my article about Blabberize. Voki - web-based. Voki combines the fun of choosing an avatar (provided) with giving it your voice. Here’s my article, Encourage Children’s Speaking with Voki. PhotoPeach - web-based. PhotoPeach is a great way for kids to use slides of photos to add text and music to, with the result a slideshow. Read about it here. Haiku Deck - web-based and iOS app. Read my review of the app here. Toontastic - iOS app. Kids animate screen puppets and use the iPad’s built in microphone to record their voices. The result is a video of their stories. Read my review here. LEGO Movie Maker - iOS app. Anything to do with LEGO is motivating, and animating it to tell a story, while a little fiddly, will make kids keen. The result is a short video. Read about the app here. Is the digital storytelling process just one that’s creative, an opportunity for kids to express themselves? Creativity and self-expression are hugely important but kids have the chance to develop many more skills during digital storytelling. Critical thinking comes to the fore both before, during and after the activity. For instance they are making decisions during the creative process that have them thinking about communication, e.g., Which sound effect would go best with my story? How can I set up this photo to really show my character's feelings? What voice would a pirate use? Great questions – great tools! I hope you'll give them a try with your students/kids.